Looking Back at 2016 & Aslan is Coming! 2016 is a year that has contained much, both nationally and internationally, for us to reflect upon and no doubt we could make much reflection on what the year has brought for us personally. 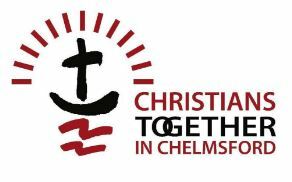 For Chelmsford 24-7, it has been a year of much activity; creation and building of relationships with churches and other Christian organisations locally, and with others involved in prayer regionally and nationally. Not least, much prayer has been offered up over our City and beyond. Our primary vision has firmly remained to be a catalyst for unity to the Christians of our City through prayer, love and relationship, so that The Kingdom of God will come to Chelmsford and that the lives of all who live, work and visit here, will be changed by proclamation and demonstration of the Gospel of Jesus Christ. We held 122 Prayer Spaces, with around 900 attendees. 3 churches now run their own in the manner of a franchise. Many could testify as to how God has moved and blessed through prayers brought at all of these. From early Autumn, we also started Prayer Walks, and had 6, involving 53 people wearing our blue reflective jackets proclaiming, ‘Praying for our City’. There were notable ‘supernatural events’ at two particular Prayer Spaces. In March, at St. Mary’s, Great Baddow, a shaft of light shone on a prophetic picture of a spiders web that David Gilbey had just drawn, concerning unity between Believers in the City. Read the story here. In April, a man called Danny, who had a serious medical issue, unexpectedly found himself in The Cathedral, and found God was already waiting for him! He found his name written right on the top of the prayer request labels in our ‘Golden Bowl’ prayer station, and more than that, underlined in Gold! Read his own account here. Easter, we provided prayer support for the 2016 Churches Together Procession of Witness and City Passion, our first outdoor Passion Play for many centuries. At the end of April, for 2 days, our portable Prayer Space was taken to the National Christian Police Association Annual Conference at a hotel in Southend-on-Sea. Pentecost we took part in Thy Kingdom Come, a week of Prayer over the UK, which included, for the first time anyone could remember, 24 hours of prayer in the Cathedral and a special day long Prayer Space at Essex Police HQ. At their AGM in May, we formally became associates of newly named Christians Together in Chelmsford (CTiC) and have a seat on the committee, ably filled by Sue Gibson. We also set up a stall, a ‘mini Prayer Space’, at the open day of the Diocesan Retreat House, Pleshey. September, we joined in with the National Prayer Weekend, facilitating locally 72 hours of continuous prayer, (just 1 hour slot was unfilled), and which included 4 Prayer Walks, in the City Centre, Great Baddow and Melbourne. 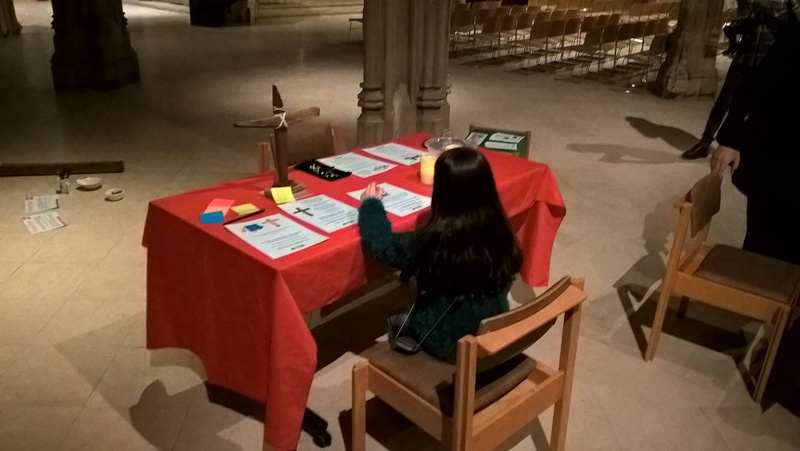 We have been part of organising and facilitating sanctuary, an ongoing youth prayer event in the Cathedral, which took place in February and October. During the year, David had the pleasure of speaking about prayer and the work of Chelmsford 24-7 at a number of local churches both on Sunday’s and at weekday meetings. Beyond Chelmsford, David was also able to build on relationship with the World Prayer Centre in Birmingham, and has attended National Prayer Days, including the National Trumpet Call in October and National Prayer Leaders Meetings. Relationships have also been grown with Prayer Groups regionally, from Southend to Norwich. In April David first met Peter Hill, from Canada, previously founder of the 1971 National Festival of Light. June 2015 God woke Peter and told him again to become involved in calling Great Britain to pray. David is now at an early stage of involvement with Call the Nation to Prayer. Our Steering Group have been a real blessing in guiding all we have done and hope to do. Our Prayer Support Team, consisting of around 20 faithful Believers from different Churches met approximately 10 occasions and we have had some amazing and powerful times of prayer and prophetic insight into the life of our City. Not least, we want to extend a massive hand of thanks to all who have been involved in any way. Whether you have attended just one event, maybe even said just one prayer, or to those who regularly and faithfully come along. Thank you all. You have and will continue to be an amazing blessing. If you have read, Looking Back at 2016, you will see all the great things Chelmsford 24-7 has been involved with. There have been some tremendous blessings. However, at times they have also been accompanied by the ‘clang’ of a spade striking hard ground! Clearly we have seen answers to prayer and many good things happen. But the going has sometimes been tough. Not all, even some Christians. are receptive to what we are doing. Not as many as I might hope understand the true power or practice of persistent and consistent prayer. At a glance, what has actually changed in our City? Where is the ‘Move of God, the ‘Revival’ that many of us have been looking for over many years? There are undoubtedly encouraging signs here and there, but can still often seem like hard going on hard ground! The question is, will 2017 be any different to 2016 and all the years before? Well, my answer is decidedly, YES, Aslan is coming! Earlier this week, on a particularly cold and frosty, but intensely sunny morning, I felt that I needed to go for a walk, to pray and to reflect and to listen. As I walked, the sun was slowly rising, and although at this time of the year without great heat, it was nonetheless melting everything that it’s rays were able to touch. Defrosted water droplets dripped from trees like rain and as the shadows receded from frost covered fields, white, turned to green. I remembered Narnia. I strongly felt that God was saying, winter is nearly over for our City and Nation, Spring is coming, the ground has and is being softened by the prayers of My people. I AM on the move! However, as our Lord and Saviour Jesus moves, we His people must move with him. It is perfectly possible to stay hidden in the shadows, immersed in the frosty glitter of life, and with our hearts frozen to those around us who are heading for a lost eternity..
As 2017 begins, it’s time to stand up, move out into the sunlight, to let the Light and love of Jesus warm and melt our hearts for Him again. We must ‘fall on our knees’ afresh in prayer before our Lord – the Saviour of the World – and then we will be able to fully join with Him as he moves and melts others hearts across Chelmsford and the United Kingdom in revival power. The Lion is Roaring! Get Ready. Previous PostCame for food, got JesusNext PostHave you considered becoming a Street Pastor?